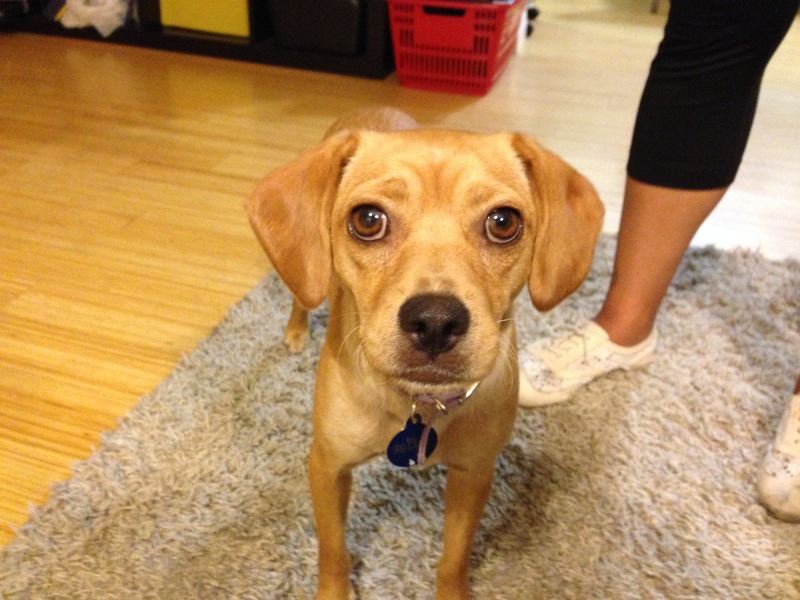 Baci is an eleven-month-old Beagle mix rescue who may have been abused in a previous home due to her growling and barking at unknown women who try to pet her and aggression towards all men. When I entered the apartment, Baci made it known that she disapproved of my presence. I avoided direct eye contact, moved slowly and kept the dog in front of me at all time. When she barked, she would feint forward a bit before bouncing back. There was real aggression in her barking, body language and movement, but I also observed some minor signs of insecurity. Her guardian and I discussed the situation a bit which is where I learned that the dog didn’t have much structure in its life. Dogs go through life waiting to be corrected when they take things too far. But if we don’t have any rules to enforce, then we don’t do much correcting. This can lead a dog to think that they are in a leadership position over humans. But instead of incorporating rules, Baci’s guardian showered her with attention and affection. This is pretty common for guardians who rescue a dog or if they think the dog was previously abused. Many people mistakenly think they can make up for what happened in the dog’s past by letting it do anything it wants. So the lack of rules make the dog think its in charge. And because the human pets the dog all the time, especially when she is acting out, the dog thinks the guardian agrees with its actions. Im guessing that Baci was a former street dog in LA. Many of her behavioral quirks are reminiscent of a dog who has had to look out and protect itself. While we certainly cant blame a dog for acting that way on the streets, the behavior is inappropriate in the dog’s new home. To help change the leader follower dynamic in this relationship, I started out with a simple recall exercise. I wanted to use a positive reinforcer to communicate to the dog that its good to listen to and follow the command of humans. Baci got better at he exercise, but was far from being good. She was clearly still off her game by the presence of outsiders so I suggested that the guardians practice this recall exercise a few times a day for a week or two. By practicing this exercise until the dog recalls consistently every time, the guardians will be helping the dog see that being a follower has its own rewards. To further change the leader follower dynamic in the home, I walked the guardians through a leadership exercise I developed a few years ago. 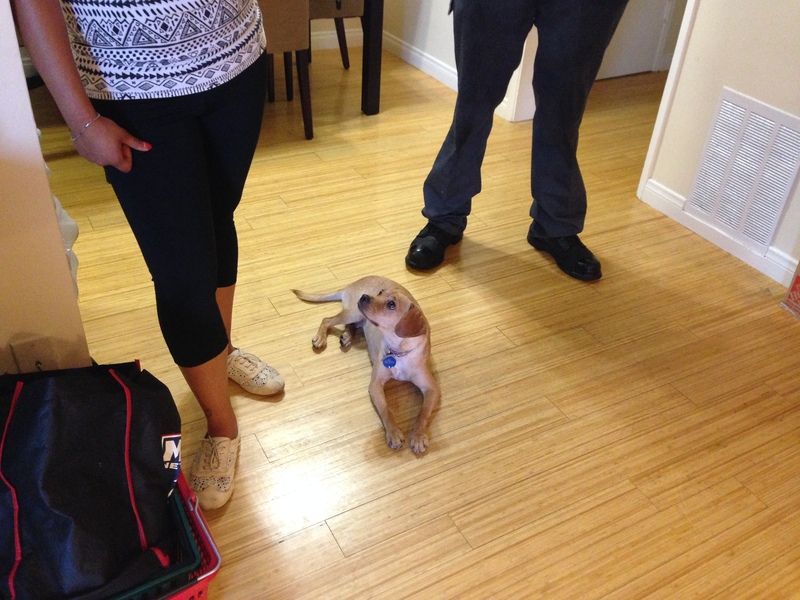 The exercise helps the humans practice establishing boundaries and correcting the dog using movement and body language. Each time the human corrects the dog, they change the leader follower dynamic for the better. At first the guardians moved to slowly, stopping before they got to the dog rather than continuing to walk at it until it turns away or sits down. Because they were so slow in their reactions and timid in their movements, the dog didn’t respond as well as Id like. It will be important for all the humans in the house to practice the leadership exercise a few times a day with the dog every day for a few weeks. Baci needs practice being lead and corrected by her guardians. Over time, these corrections will help the dog be less assertive or challenging. Once the dog starts laying down right away, then the guardian will be ready to make the exercise more challenging. We do this by adding time. By waiting longer an longer after Baci lays down to communicate she understands and is no longer challenging, her guardians will be able to help the dog develop the ability to control herself. As we were discussing the leadership exercise and why its so important, I noticed that Baci continually inserted herself between her primary guardian and anyone else who was near by. This is a subtle move that can easily be overlooked. But I recognized it as Baci’s way of attempting to keep the primary guardian to herself. While it doesn’t seem like a big deal for a dog to sit between its guardian and another human, if it happens repeatedly, it signifies a problem. I learned that the dog did this on the couch, in the bed and other scenarios. Because of this and the aggressive behavior, Baci’s primary guardian needs to change her behavior in relation to the dog. She can no longer continue to pet her for looking cute or being nearby. Instead I suggested that the guardian start petting the dog for a reason. When a dog nudges us for attention and we give it, we are telling them they can tell us what to do. This easily causes the dog to think they are in a position of authority over the human. This is likely part of the reason Baci is so reactive when new people come around. By giving the dog a counter order of “sit,” or ‘lay down” when the dog asks for attention, then only petting the dog after it obeys, we can help further change its perception that its in charge. If a dog thinks of itself as a follower, challenging a new arrival without the convent of the humans would be inappropriate in the dogs mind. It will also be important that the guardian start to correct the dog EVERY TIME it breaks a rule or acts inappropriately. If the dog reacts and the guardian doesn’t disagree, the dog thinks that she agrees with its actions. It won’t happen overnight, but the more the humans correct their dog with good timing, the more it will respect them as authority figured. Combined with leading and reward the dog for wanted actions and behaviors, Baci will start to engage in them on her own and leave the responsibility of leading the group to her guardians.